These bright and cheerful cows are gazing out ready to graze. This is an original acrylic painting offered as a professional quality, archival ink Giclee. It is on stretched canvas and is ready to be hung. It is 16 x 20 but can be ordered in other sizes. Judy Katon Heim is willing to sell this fantastic piece of art. 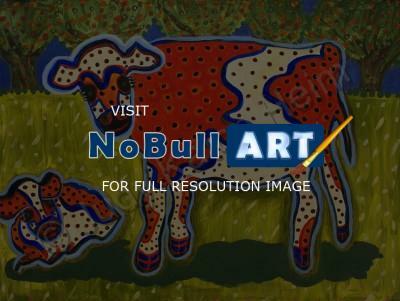 Professional quality Giclee of an original acrylic painting. The lively colors and bright figures are painted in the aboriginal art style.